Meek, 30, whose real name is Robert Rihmeek Williams, is currently a few weeks into serving a two- to four-year prison sentence for a probation violation related to a gun possession case he caught when he was 18 years old. His attorneys filed a motion for bail on Nov. 16, but Judge Genece Brinkley has yet to issue a ruling on that motion. 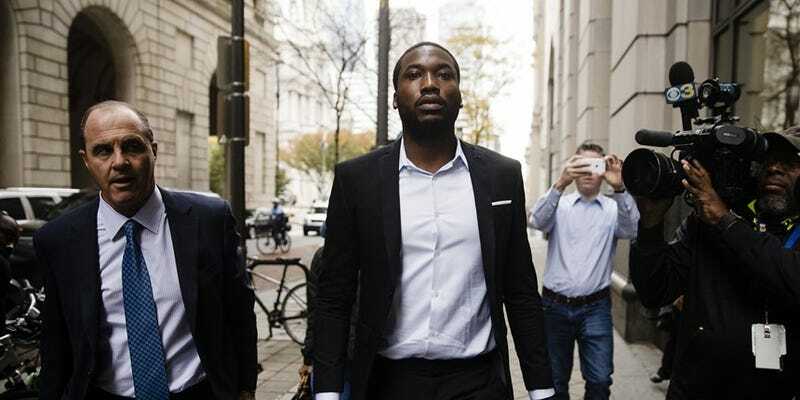 On Monday, Meek’s attorneys filed a habeas corpus petition, claiming that Brinkley was ignoring Meek’s post-sentencing motions and making it impossible for him to file an appeal, according to the New York Daily News. Brinkley sentenced Meek Mill to prison earlier this month after a drug test came back positive for the prescription drug Percocet and the rapper was arrested twice this year—once for an altercation in a St. Louis airport and again for popping wheelies on a motorcycle in New York. The criminal charges in both of those arrests were later dropped, but the judge determined that the mere fact he was arrested violated the terms of his probation. She sentenced him to prison even though both a prosecutor and Meek’s probation officer recommended that he not be jailed. On Monday the Rev. Al Sharpton visited Meek at the prison in Chester, Pa. He called for Brinkley to “step aside” from the case. Sharpton also posted a video to his Instagram account discussing Meek. If we are being completely honest, Meek is getting a very raw deal. He is being denied bail in a case that is 10 years old while politicians accused of what is essentially treason are out free on bail. It’s a travesty and a miscarriage of justice.